As I write this, the Oklahoma teachers strike has entered its second week. Large-scale protests have also taken place in Kentucky and Arizona. Coupled with the strike in West Virginia, we have now had more than seven weeks of almost entirely positive media coverage, local school district support, and an extraordinarily quick legislative response for teacher job actions. The answer, unfortunately, is no one knows — not even the teachers unions. The unions are organized. They have spokespersons and a direct line to everyone marching on state legislatures. This makes them the obvious, perhaps the only, choice as representatives with whom government officials can negotiate. That’s convenient, but also problematic. For one thing, a majority of education employees in these states don’t belong to any union. Second, many of those who do belong to unions are conflicted about, if not downright hostile to, the unions’ actions during the strikes and their shared responsibility for the straits in which they see themselves. Finally, it’s far from certain that the strikers will abide by decisions the unions make. In West Virginia, a coalition of three school unions cut a deal with the governor to end the strike March 1. The deal included a 5 percent raise for all school employees and 3 percent for other state employees. Health insurance premiums were to be frozen for 16 months, and a task force was appointed to address future funding. The strikers were unhappy with the deal, and the primary reason appeared to be the lack of long-term action on health insurance. They chanted “A freeze is not a fix!” and “We got sold out!” when the agreement was announced. Evidently, the state union officers did not notify local leaders and the rank-and-file members in advance about the terms of the agreement. They continued the strike against the wishes of the union coalition. The strike ended after nine days with a deal that extended the 5 percent raise to all state workers. When the governor signed the bill, teachers went back to work. There still was no permanent fix to the state’s health insurance system, and the task force proposal remained the same. Only those on the fringe seemed to notice the deal was substantially the same as the one rejected days earlier. The end of the wildcat strike was as startling as its beginning. Spurred on by events in West Virginia, Oklahoma teachers threatened a walkout if they did not receive a $10,000 raise phased in over three years. 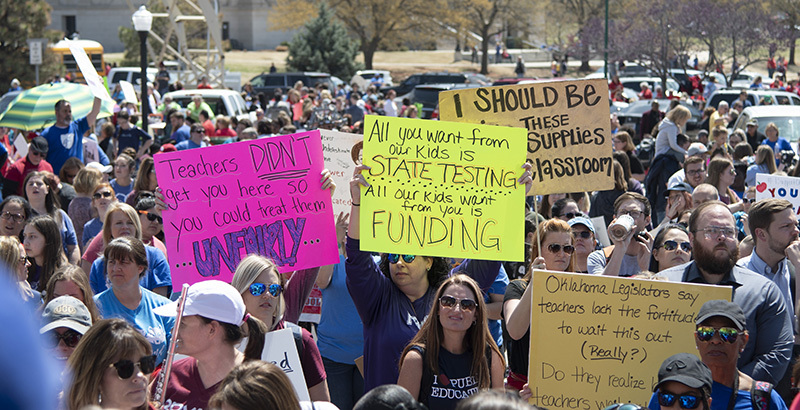 Who originated that specific demand is a matter of debate, but ultimately the Oklahoma Education Association, the Oklahoma City Federation of Teachers, and an independent group called Oklahoma Teachers United all signed on to the work stoppage. In an effort to head off the walkout, the state legislature passed a $6,000 salary increase. The Oklahoma Education Association announced the strike was still on. Unlike West Virginia, which has 55 county school districts that all remained closed for the duration of the strike, Oklahoma has more than 500 districts, making unanimity a virtual impossibility. As the strike has progressed, crowds have grown, but the number of districts participating has shrunk. It seemed the battle lines were clearly drawn: The strikers would hold out for the full $10,000. But that has not been the case. Oklahoma City American Federation of Teachers President Ed Allen told Payday Report he would advise members to return to work if the $6,000 raise passed the legislature (it did). However, Oklahoma City schools remained closed. 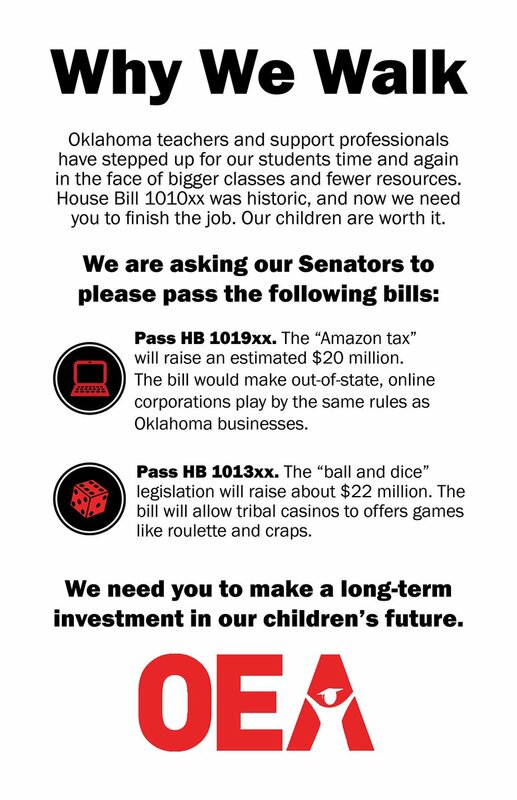 The Oklahoma Education Association hasn’t mentioned its $10,000 demand in the past few days, focusing instead on a series of funding measures. First it was the “Amazon tax” and casino “ball and dice tax” that needed to make it through the legislature. They did, and association president Alicia Priest said, “We’re really close” to ending the strike. On Monday, the union stated it was necessary for the governor to veto a repeal of the hotel and motel tax and remove the tax exemption on capital gains. At what point the association will declare victory and go home is now an open question. And since there appears to be little chance that lawmakers will reconvene to add another $4,000 to the pay raise, will the strikers return to work when the union says so? The protesters in Kentucky are demanding a veto of legislation that would establish a new pension system for new teachers. The situation differed from those in West Virginia and Oklahoma in that most school districts were on spring break, although some that were in session had to close because of walkouts. 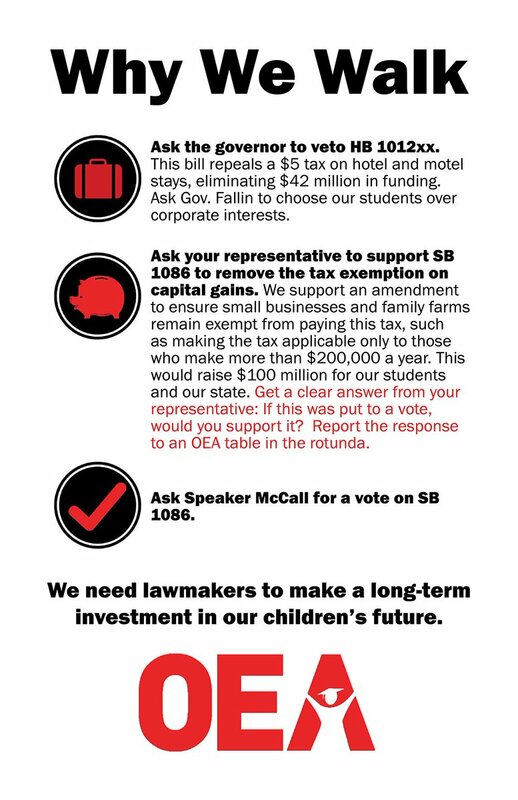 This week, the Kentucky Education Association has directed teachers to return to work, primarily because the legislature is on recess until Friday. The union is apparently working in concert with the grassroots group of teachers calling themselves KY United 120 Strong. Even so, there has been resistance to the union’s stance, and there are significant differences between the groups regarding tactics and next measures if the governor signs the pension bill. In Arizona, the union has deferred to the grassroots group Arizona Educators United. “They’ve really let us drive this and steer this,” said Noah Karvelis, one of the group’s organizers. They are demanding a 20 percent pay increase and funding returned to 2008 levels. The governor said that isn’t going to happen. Despite the cordial relationship between the union and the ad hoc group of teachers, the question of who gets to call a statewide walkout and who gets to call it off is still unanswered. The National Education Association is lending financial, staff, and moral support to all these protests, but it is also trying to use them to move along its own agenda. “In states like these — where anti-union laws frustrate educators’ ability to come together to advocate for quality public schools through the stable, formal channels of mature collective bargaining — the only meaningful option available is for educators to press their demands through mass protest and the disruptions in public services that those entail,” he wrote. Walta is promoting the chaos theory of a post-Janus world. In this vision, unions are the stabilizing force keeping workers from grabbing pitchforks and storming capitols, all through “formal channels of mature collective bargaining.” Agency fees are supposed to be the price of labor peace. There are a few problems with his argument. Apparently, the collectively bargained agreements in places like Oklahoma City, Tulsa, Tucson, and Jefferson County, Kentucky, have not had much effect on mass protest and disruptions in public services. Nor would Janus affect any union’s collective bargaining status. From NEA’s national headquarters on down, officials in the formal union structure want to ride this wave of teacher activism that holds the promise of achieving many of labor’s goals. Their fear is that the wave may wash them away as well.